Former Liverpool man Luis Suarez has revealed that there is nothing to the speculation linking former teammate and Psg big money signing Neymar Jr to Real Madrid. Naymar left Camp Nou for a record fee of €222million fee in August for the Ligue 1 giant but Suarez insists that his admiration for Bercelona will not allow him join their arch-rival. 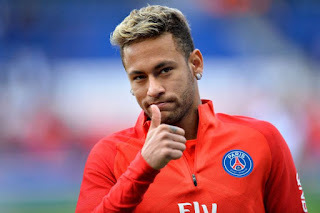 Neymar is on contract until 2022 with Psg but speculations linking him with a return to Spain and a controversial switch to Les Merengues has persisted. However Luis Suarez, Neymar's former teammate is confident that the situation will not arise. "Not at all." He told Marca. " Honestly , i do not see it. "I know how Neymar is and the admiration he had for Barcelona and his team-mates. I do not see him now going to play for Real Madrid." Suarez also speak about Neymar's decision to leave Barcelona, insisting he understands why he and his family made the decision they did. "Ney is a mature person and was fully aware of the decision he made," Suarez added. "Obviouly he did it with a lot of pain, because he was happy here. But we all have to accept that he had other challenges and that he wanted to take them on. "It was an understandable decision that he took with his family. There is no reproach, just admiration and pure love for everything that he has given the club and the relationship we had throughout those years." It is obvious Barca do not appear to have missed Neymar's presence on the pitch, with Messi going as far as saying that they are actually a better, more balanced team without him. Suarez also believes the players brought in to replace the Brazilian have done well, particularly Paulinho. "Neymar is a different and special player of whom many things were expected, said Suarez. "Other footballers who contribute a lot have come in, like (Gerard) Deulofeu, who had already trained at the club. "Also Paulinho, who has silenced many critics and is performing at a high level since he arrived. He is one of the captains of Brazil. "(Ousmane) Dembele had the bad luck to injure himself at first, but when he is well you will see how he surprises many. "Now there is a lot of speculation with players who can come and with others who might leave, but we remain unaware of this."